Haryana State’s District and Session Judge and the Punjab Haryana High Court Recruitment of Staff in Subordinate Courts / Society for Centralized Recruitment of Staff in Subordinate Courts under High Court of Punjab and Haryana (S.S.S.C.) on behalf of the District and Sessions Judges of the State of Punjab Notification for Recruitment to the 352 Posts of Clerks against 352 Vacancies update on official website. Online Registration is in 7th Jan 2019 and the Deadline for Online Application Forms – Registration I ending is 7th Feb 2019. We look forward to the Office of the Member Secretary Society for Centralized Recruitment of Staff in Subordinate Courts Punjab and Haryana High Court, Chandigarh, to conduct quickly Optical Mark Recognition Based Written Test / Optical Mark Recognition Based Screening Test for the Candidates. First Alerts both on the Date for the Optical Mark Recognition Based Screening Test and issuance of the e-Admit Cards / Hall Examination Tickets likely to be declared soon would be published on our Website for the ready reference of the Candidates. Any Un-Reserved Candidate should have completed (Minimum) 18 Years but must not exceed (Maximum) 37 Years of Age. Relaxation in Upper Age Limits to Reserved Community. The Applicant should possess a Degree in Bachelor of Arts (B.A.) or Bachelor of Science (B.Sc.) or Equivalent thereto from any University recognized by the Central Government / State Government. He/she should have passed Matriculation Examination with Punjabi as one of the Subjects and must have Proficiency in Operation of Computers (Word Processing and Spread Sheets). 33% Marks in each Subject but no Candidate shall be considered to have qualified the Optical Mark Recognition Based Written Test unless he / she obtains Minimum 40% Marks In Aggregate of both Subjects. There shall be Negative Marking in Objective-Type Multiple Choice Questions. For every Wrong Answer to the each Objective-Type Multiple Choice Questions submitted by the Candidates, /4th of 0.25 the Marks allocated to the MCQs would be deducted. The Question (s) not attempted by the Candidates will be awarded receive Neither Credit nor Discredit No Credit Or Discredit. Thereafter, out of the Total Candidates who qualify the Optical Mark Recognition Based Written Examination, the number of the Candidates, as decided by the Hon’ble Central Recruitment Committee (CRC), may be called for a Computer Proficiency Test (CPT), i.e., to assess the Proficiency of the Candidates in operation of Computer (Word Processing and Spread Sheets), which is mandatory but the Marks of this Test would not be counted towards the Final Merit as the Computer Proficiency Test is only of Qualifying Nature. The Computer Proficiency Test shall consist of Two Parts. In Part-I (i.e., Word Processing Test), the Candidates shall have to qualify the Computer Typewriting Test (CTT) in English at the speed of 30 Words Per Minute In Part-II, the Candidates will have to qualify the Spread Sheet Test (SST). The number of the Candidates, as decided by Hon’ble Central Recruitment Committee, who qualify the Optical Mark Recognition Based Written Test (OMRWT) as well as the Computer Proficiency Test (CPT), will be called for Personal Interaction and Verification of the Original Documents / Certificates / Testimonials. Thereafter, Final Select List of the Qualified Candidates will be prepared strictly based on Merit in the Optical Mark Recognition Based Written Test. The Name(s) of the Candidate(s) Higher in Merit would be recommended for Appointment as per the Number of the Vacancies to be filled. Help Line: For any Technical Help regarding the filling of the Online Application Form, the Applicant may call at Help Line Numbers 8699002541, 8699002542 or 9115898394 between 10:00 A.M. up to 05: 00 P.M.
For any other Query regarding the Terms and Conditions of the Advertisement Applicants could call at Telephone No. / Landline No. 0172 – 272 2012 of the Society for Centralized Recruitment of Staff in Subordinate Courts (S.S.S.C.) on all Working Days between 10:00 A.M. up to 05:00 P.M.
For depositing of Fee related Issues, the Applicant can call up on Mobile Phone of the Bank Authorities 9780762998, 9779074638 during the Banking Hours. 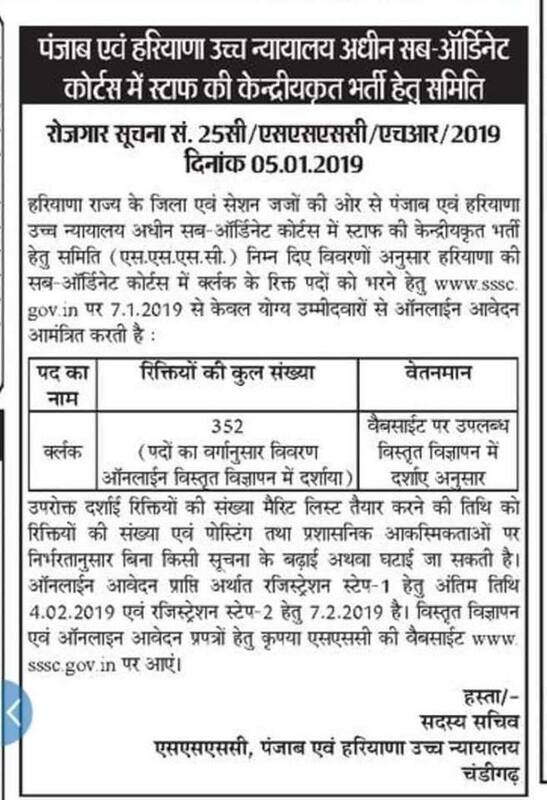 Press Click here on the Society for Centralized Recruitment of Staff in Subordinate Courts Website to download Detailed Online Advertisement / Notification. Press Click here on the Society for Centralized Recruitment of Staff in Subordinate Courts Web Portal for Online Registration.